Every year, from late March to early May the cherry blossom front (桜前線 sakura zensen) moves in a wave across Japan from southwest to northeast. Blue tarps and picnic lunches blanket the best viewing spots as the full bloom arrives in each location. For anime seichijunrei fans and butaitanbou practitioners, this also means a precious and short window of time to capture the location models for favorite works before the blossoms drop. 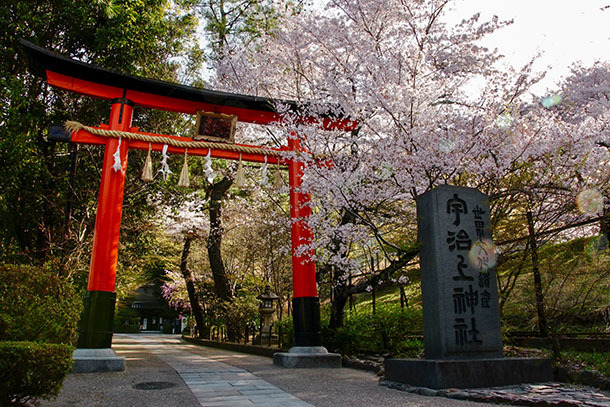 In cases where sakura were depicted in the work, this is a brief opportunity for the perfectionist to capture images of locations as they appeared in the series. Otherwise, its a fun and fleeting chance to see these places with an extra dusting of pink and white. I followed anime pilgrims as they visited sites during this time period and curated some of the best images from each location. Returning favorites include Uji, Kyoto Prefecture for Hibike! Euphonium; Kawagoe, Saitama Prefecture for Tsuki ga Kirei; Ōgaki, Gifu Prefecture for Koe no Katachi; Noto Railway stations in Ishikawa Prefecture for Hanasaku Iroha; and Hirosaki, Aomori Prefecture for Flying Witch. But they’re all wonderful! The featured image of Ujigami Jinja at top was graciously provided by Ebisu (夷 @ye_bi_su). @tsumuri_f5 made a cherry blossom pilgrimage to Takehara, Hiroshima Prefecture for Tamayura. @fureshima2223 (post), @fragments_sue (post), @Roan_Inish (post) and @626shin (post) made cherry blossom pilgrimages to Kawagoe, Saitama Prefecture for Tsuki ga Kirei. @teo_imperial made a cherry blossom pilgrimage to Hannō, Saitama Prefecture for Yama no Susume. The blog Shiofilm published a cherry blossom pilgrimage to Ogawa, Saitama Prefecture for Non Non Biyori. Ano Hi Mita Hana no Namae o Bokutachi wa Mada Shiranai., Kokoro ga Sakebitagatterunda. Saenai Hiroin no Sodatekata, BanG Dream! @hoe0808 made a cherry blossom pilgrimage to Ōgaki, Gifu Prefecture for Koe no Katachi. @offtama published a report with extensive photography from the Takayama Matsuri, including cherry blossoms and Hyōka pilgrimage.